Between the Scottish border and the chalk cliffs of Kent, the only high cliffs on the eastern side of England are those of Yorkshire. 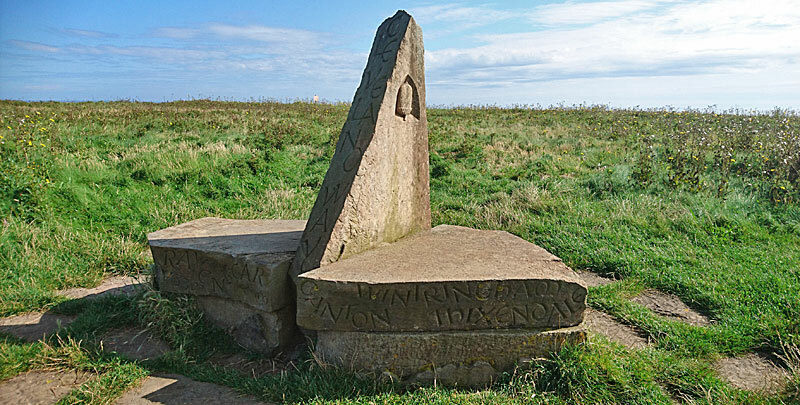 The Cleveland Way runs along the bulk of them, starting from close to the seaside resort of Filey and running through Scarborough and Whitby to Saltburn. Mostly, these are sandstone cliffs; to Filey’s south-east, out of scope for the Cleveland Way, is a short range of chalk cliffs culminating in Flamborough Head. Hence, the Cleveland Way provides a sea-cliff experience quite unlike anything else in eastern England. I walked all but the start of this in a short December break, outside my normal walking season. Truth is, I scoured weather forecasts for the best likelihood anywhere in the nation of a few good days, and for once the predictions came true. Saturday 26 August 2017. Filey to Scarborough, nine miles (eight on CW). Gathered in Filey for a family get-together, I took the chance of a quick solo excursion along the first part of the Cleveland Way. I had half an eye on logistics for the future. Filey is a slightly awkward place to get to, on a branch line with an erratic timetable, compared to Scarborough; also, the official start of the Way is at Filey Brigg, a mile from town, rather than in the town itself. That mile is in fact the completion of the Wolds Way, which is on my list for 2019. Scarborough is in view just a mile from the Brigg, beyond the small promontory of Cunstone Nab. It’s a popular walk between the two towns, albeit not for everyone in one go, broken in two as it is by the descent to Cayton Bay. Alas a landslip now routes the Way along a road for a short distance thereafter, and the final stretch is along the prom of Scarborough’s South Bay, but the town is one of my favourite seaside resorts anywhere, so I hardly minded. Saturday 2 December 2017: Scarborough to Cloughton, seven miles (six on CW). As the first part of the day was taken up by travel from London, and then a lunchtime bite in the town, the early closure of the winter day allowed only a short walk in the afternoon. I was soon back down at the harbourside to meet up with my ‘finish’ in the summer. The question had been where to finish the stage. Beyond the village of Cloughton – essentially a Scarborough suburb these days – the route quickly gets more remote, and most crucially, further from the regular bus service along the Scarborough – Whitby road. No great difficulties in walking this section, which starts with a stroll round Scarborough’s Castle Cliff and along its North Bay, to the start of open country beyond the gushing stream of Scalby Beck. However, the proximity of the Coastal Path to the town, and thus regular use by locals, meant there were long stretches of mud. At Long Nab there’s an old look-out post, once pressed into the Cold War early-warning system, but now with a far more gentle function as a birders’ observation post. From Cloughton Wyke I took a path inland to the village for my bus to Whitby. 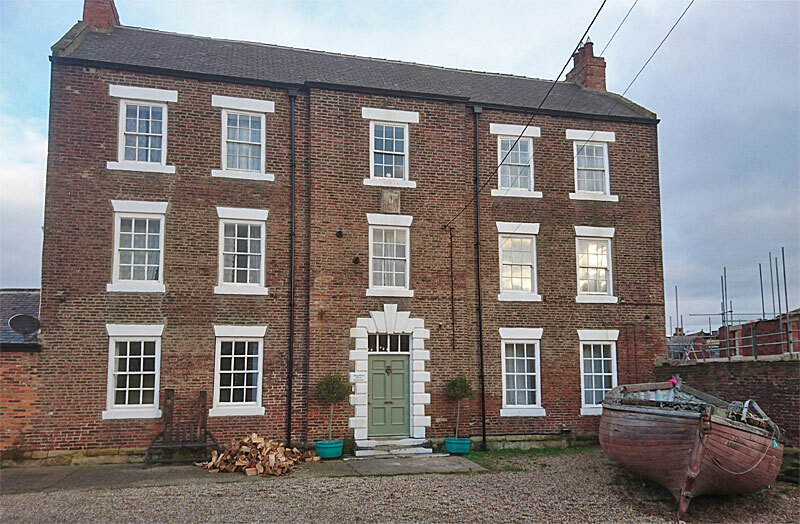 It’s perfectly possible to stay in the village pub (a bit pricey, but then the Queen had lunch here don’t you know) or its large hotel (better value) but I’d decided on two nights in Whitby. Sunday 3 December 2017: Whitby to Cloughton, 16 miles (15 on CW). Walked in reverse, so that I didn’t have to waste my limited daylight hours on a bus trip. Whitby hostel is high above the town, so I had a good view over it as I started off. The dangers of the coast to shipping were soon evident, with the Whitby fog signal and the High Light lighthouse close together. At Oakham Beck, Wainwright’s Coast-to-Coast Path joins in, for its last few miles to Robin Hood’s Bay. The fishing village named from the bay, now a tourist honeypot, was looking at its best on this glorious early winter’s day, and though a bit early on, it called for a brief coffee-and-cake stop. The path onward takes to some relatively scruffy ground, but at low tide it’s allowed to take to the beach for the mile to Boggle Hole, and this was far too good an opportunity to miss. A busy old beach it was too, with day trippers enjoying the sun. There’s a surprising industrial interlude a couple of miles on, as the Way comes to the former Peak alum works. Here, for 250 years to the development of synthetic dyes in the mid-19th century, the local rock was mixed with urine and seaweed to make alum dyes; possibly, then, the walk might not have featured on a recreational trail. It’s now a stiff climb up to Ravenscar, where the 40-mile cross-moors Lyke Wake Walk terminates. Once, this was a popular 24-hour challenge walk, but it seems to have fallen out of favour recently, though that does moorland ecology no harm. It’s a grand stride along high cliffs from here, to the pleasant wooded dell at Hayburn Wyke. I met another southbound walker here, who would be continuing to Scarborough with (eventually) head torch. But for me, the day was nearly done. Monday 4 December 2017: Whitby to Skinningrove, 17 miles. A beautiful sunny start, the ruined abbey lit by the sun. The previous night the moon had risen over it, but now Dracula was surely at rest – in Bram Stoker’s novel, the Count made landfall at Whitby in a shipwreck. From the youth hostel it’s down 199 steep steps to the town itself. Because of my logistics, I had got quite used to these steps, and great fitness training they were – up and down from the bus station and town pubs on both previous days. But because of the long day ahead, I had no time to linger, despite an early start. Thankfully I already knew Whitby reasonably well from earlier trips. It’s a wonderful English seaside town, one of the very best. 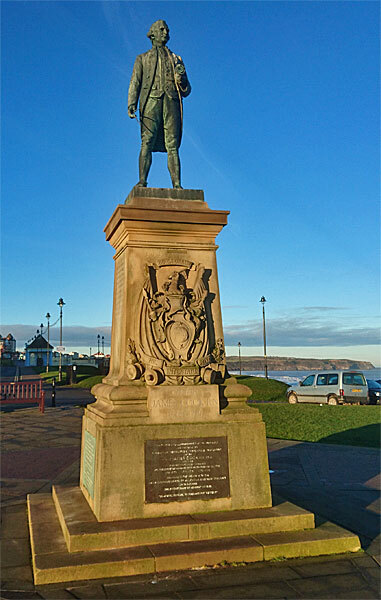 Once the centre of English whaling, Whitby was also the home port of the great navigator Captain James Cook. A statue to him of 1970 bears, in relation to Australia, the claim that “From this discovery emerged a nation” – these days, we might recognise that there was a civilisation there already. The day has an easy start to the village of Sandsend, although marred by a diversion to the A174 so that the golfers can have their sport untroubled by walkers. After a quick cup of tea, the Way takes the old railway line for a while, until where the track once entered a tunnel, thus forcing a steep climb above Over Dale to the field-top. The cliff is soon regained, through Kettleness, where there is a sharp drop to the beach at Runswick Bay. The village is entered by a slippy path beside a stream that must in spate be quite treacherous. From here though, the low tide which I enjoyed meant a stroll across the beach to the village. Essentially, Runswick Bay is a mini version of Robin Hood’s Bay, straggling steeply down (or more properly given my direction, up) the road from the cliff-top – but without the quaintness, so it never has the crowds. I’d planned lunch here, but decided on the upper pub rather than the lower, only to find it closed on a winter Monday. Port Mulgrave was a bit of a find, another site for industrial archaeology; once, its tiny harbour shipped ironstone, with a little narrow-gauge railway heading inland. It was a steep and eroded little path down to the quay and I was glad that the Way didn’t take it. There was a steep descent to come, but this was down a street in Staithes, another sibling to Robin Hood’s Bay. The village faces north, so never gets the sun, and there’s no beach, but there is a bit of quaintness, so in a way it’s an anti-Runswick Bay. The sun was glorious on the rocks though, and the Cod & Lobster pub did a welcoming lunchtime pint with crab sandwich. From the descent into Staithes, the Boulby Mine had been in clear view, and it dominates the landscape around here. It’s no industrial relic, but a key part of Britain’s chemical infrastructure, producing half our potash. On the way out of Staithes, it’s barely a few hundred yards from the trail, but beyond it, the Way starts a steady climb up to the highest point on the coastal Cleveland Way, at Galli Howe. From here it’s a slow descent, on a recent improvement to the Way, steering the path closer to the cliffs, all the way to my target of Skinningrove. Out of sight somewhere was its steel mill, which produces almost all the rail used on Britain’s railways. Tuesday 5 December 2017: Skinningrove to Saltburn, four miles. In fact the steel works is perched just above the Way on its exit west from Skinningrove; the path passes underneath a bridge that once linked the works to the small harbour here. 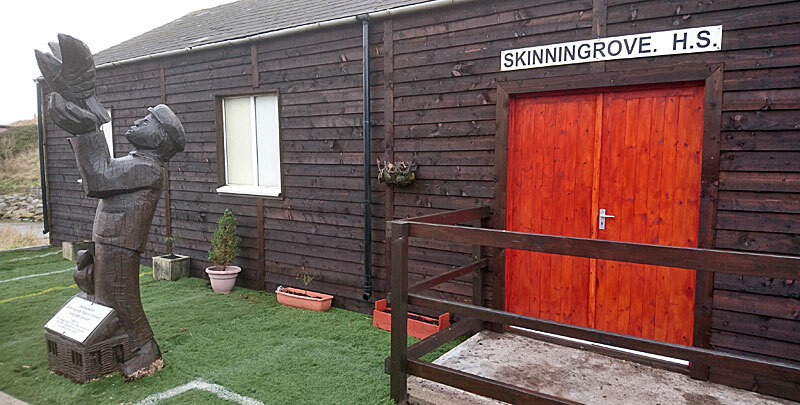 The village itself is full of interest, with a mining museum, improved beach access, and a wood sculpture to the local passion of pigeon racing outside the local fanciers’ hut. Above the beach there are sand dunes, the only stretch on the Way and a nice change that feels more like Cornwall than Yorkshire. The Way then heads slowly up to Hunt Cliff, where the path is hemmed in between the cliff and the Cleveland Railway, now freight-only, but essential for taking away the produce from both Boulby and Skinningrove. Just before I reached it, a potash train lumbered slowly along the track. A wind chime on a little knoll was a good place for a pause. Saltburn, and beyond the industrial complexes of Middlesbrough, were now clearly in sight. The path slowly dipped to the former, with a sharp little drop and then a rise into the town itself. I found a nice little café for lunch not far from the station and then made my way home, already contemplating my return and the traverse of the North York Moors. 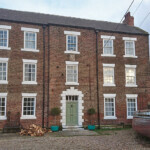 For the family holiday in Filey, our large group took over Cherries, a self-catering property not far from the beach. With six bedrooms it was just right.